Go back in time to an era of luxurious outfits, cocktails and a night of classic burlesque with top burlesque and boylesque performers from Edmonton, Calgary, and beyond! Styled after a past era of extravagant parties, this is an intimate show without the separation of stage: burlesque artists will be performing mere inches from your seat. If you're craving glittery costumes, glamour, or wild gin-soaked revelry – you've come to the right place. For this vintage speakeasy-style show, doors open at 7pm and the show starts at 8pm. House of Hush also produces THE LATE SHOW, which starts later in the evening. Click here if you’re looking for tickets to the LATE SHOW! Friday, May 10: "You Got Rhythm"
We’ve got rhythm, we’ve got music, who could ask for anything more? Bringing you swinging rhythms, starlight, and sweet dreams. Tickets start at $26 per person. Doors are 7pm, show at 8pm. The show runs just over an hour, with a short intermission in the middle. 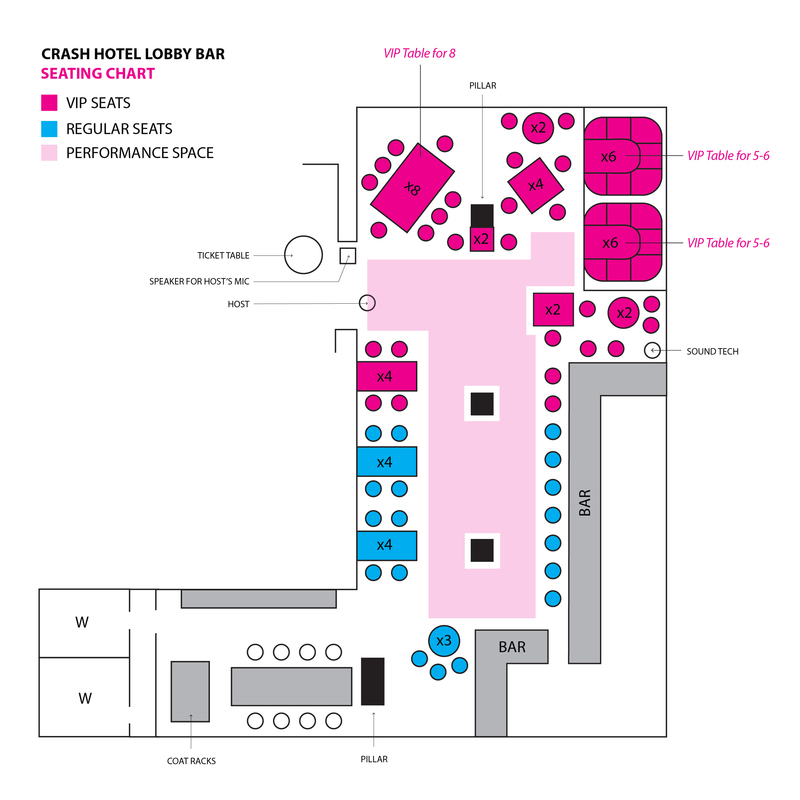 Note, the Crash Hotel lobby is an intimate venue: there is a limit of 48 seats available per show. Every seat is sold (and our shows always sell out!) so expect to be seated at a table with other guests. Want a table to yourself? Purchase one of our VIP tables (we have two booths which seat 5-6 guests each, and one table that seats 8). Coming alone? Please do! We will seat you at the bar, or with some future friends, and you’ll have a grand time. Please note, tickets are non-refundable. To see a map of the seating chart click here. Check out our promo reel to see what the space looks like. Friday, June 28: "The Lush Life"
Luxuriant, succulent, tender and juicy: the Lush Life. Tonight, we will be pouring forth the opulence without restraint. Friday, July 19: "Too Darn Hot"
Come spend a hot, long summer night with House of Hush. There is no show in August. Go out and support your local summer festivals, such as the Edmonton Fringe Festival! We have plans to behave recklessly tonight, come hell or high water. Our performers plan to contradict conventions and play tricks on you in the most delightful manner possible. If the cold Edmonton weather has you feeling blue, let House of Hush warm up your heart! Bringing you red-hot, fiery acts to kindle the coals of your soul. Oh baby, it’s cold outside. Why don’t you come over to Crash Hotel and get cozy with us? Kick of your Christmas Party season with House of Hush, bringing you all those classic and classy Christmas tunes, iced with the glitter of burlesque.